je85 - Brian Enos's Forums... Maku mozo! I tried a google search for canyon creek customs but I cant find a website. Does anybody have contact info for Rich? Thats right. A part that virtually never gets removed. Are you sure it came out of the shadow 2? Also interested in the MBX comp. I cant find any reviews on it. Like I said before the Rock Island is an ok gun however no way would I pay for one all dolled up. Thats like trying to make a silk purse out of a sow's ear. The metal rock island uses is a very poor and low quality cast. If you said you only plan on shooting 5k rounds a year for 2 years than a stock RI will get you by but if your serious in the sport 15-20k per year is a minimum. The rock island is not going to hold up well. The hayes rock island isnt anything special. They make some fancy cuts in the low quality slide and replace some fire control parts. The TSO will last as long as a STI. Do yourself a huge favor and spend a few more dollars on a STI or CZ. Trust me you will thank me later. je85 replied to Acer2428's topic in Travel, Locations, Ranges, etc. The stock 1 weighs the same as the stock 2. I have a burris FF3 on a dovetail mount. Functionally no real advantage to having the slide milled. The benefit to milling is getting the optic low. It was mainly designed for the IDPA market. 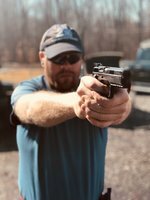 The stock 2 is the go to gun for USPSA production. I have the stock 1 myself and the only thing I dont like about it is the front and back strap. They should have checkered it like the stock 2 & 3 What are you planing for optic? Milled or sight plate? The stock 1 & 3 also fit in a CZ shadow 2 holster.